Eradicating poverty is a common goal for human beings, and a worldwide challenge. The Communist Party of China (CPC) and the Chinese Government have long attached great importance to poverty alleviation and development as well as been an active advocator and powerful promoter of the global cause of poverty reduction. 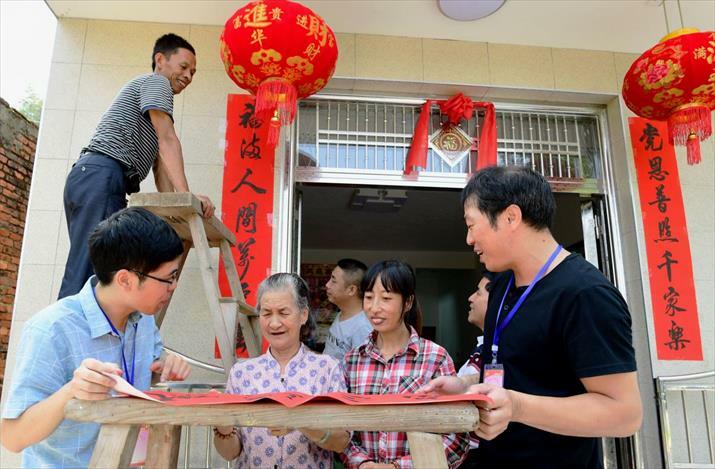 Particularly, since reform and opening up began in the late 1970s, Chinese people have spared no efforts in the fight against poverty and realized historic achievements. China has been conducting large-scale, well-organized and planned programs on poverty alleviation and development since the mid-1980s. With the joint efforts of the entire Chinese society and support from the international community, China has lifted 700 million people out of poverty and become the first developing nation to realize the goal of eradicating extreme poverty and hunger under the UN's Millennium Development Goals. The Millennium Development Goals Report 2015 shows that the number of citizens China has raised out of poverty accounts for 70 percent of the world's total, making it a significant contributor to advancing the goals. Since the 18th National Congress of the CPC in 2012, the Chinese Government has made it clear that all poor rural residents, as defined by the current prevailing standard, should be lifted out of poverty by 2020. The problem of regional poverty should also be solved. Winning the battle against poverty and achieving the goal of building a moderately prosperous society in all respects is currently at a critical stage. Over the past four years, with consistent efforts, about 55 million rural poor residents were lifted out of poverty from 2013 to 2016. The target of lifting 10 million people out of poverty annually was fulfilled in four consecutive years. The income growth rate of poor residents in rural areas was higher than the national average, and the livelihoods of destitute households were significantly improved. In practice, poverty alleviation efforts have been directed by the government with diverse participants from different regions, departments and professions pooling their efforts for a shared goal. China has carried out targeted poverty alleviation. A total of 320 central departments were assigned to pair with 592 destitute counties to help them shake off poverty. In addition, 68 centrally administered state-owned enterprises assisted anti-poverty efforts in 108 impoverished counties in disadvantaged former revolutionary base areas, helping more than 10,000 poor villages address water, electricity and other infrastructure problems. We also supported concerted efforts in poverty alleviation. A total of 18 developed provinces and cities in the east supported 10 less developed counterparts in the west by providing them with funds, skilled professionals, innovative ideas and business investment. All sectors of society were encouraged to participate in anti-poverty programs. In 2014, China set October 17, the International Day for the Eradication of Poverty, as China's Poverty Alleviation Day with the aim of encouraging social participation in the cause. President Xi Jinping said helping people to live a better life is the original intention and ultimate goal of our entire work. China has constantly adhered to the principles of depending on the people, serving the people, making the people share the results of development and striving for common prosperity. To this end, the Central and local governments have been prioritizing issues concerning poor people's living necessities, compulsory education, basic medical care and housing. Large-scale special programs on poverty alleviation were launched and favorable policies and financial support were introduced. In 2016 alone, financial support for poverty alleviation at the central and provincial levels amounted to 100 billion yuan ($15.09 billion). Micro-financing credit for anti-poverty efforts was increased by 170.6 billion yuan ($25.74 billion). A total of 8.02 million poor households received small loans totaling 283.3 billion yuan ($42.75 billion). The poor population in specific groups such as women, children and the elderly has been taken as the focus of poverty reduction, and the government has increased support for these groups in policy priorities. We have been making efforts to increase people's desire and ability to develop themselves and to help them form a mindset of self-dependence and shake off the shackles of poverty and backwardness with diligence and hard work. We have been persistently taking targeted poverty alleviation as the fundamental tactic for poverty alleviation efforts. President Xi stressed that a targeted approach is vital in fighting poverty, and it will determine the success of the poverty alleviation drive. We have proposed such a targeted approach at a time when China faces a daunting challenge in its efforts to eliminate the final pockets of poverty across the nation. Targeted measures are implemented in terms of funding, projects and recipients. Every impoverished household is guaranteed help, every village has designated officials to carry out poverty eradication measures, and goals are met within defined standards. We have registered every impoverished household in a unified system to analyze the reasons why they are poor. Based on this data, we introduce targeted measures for every poor person, household and village. While rejecting a one-size-fits-all approach, we are committed to advancing the poverty alleviation campaign with patience and accuracy. Specific approaches include lifting people out of poverty through developing industries, relocation, offering compensation for ecological conservation, improving educational conditions and providing a social safety net. Poverty reduction efforts have been made in 10 major areas like healthcare, education and finance and through 10 major programs such as vocational training, micro-finance and assistance from enterprises. We have been taking a problem-guided approach and emancipating our minds to come up with innovative mechanisms based on China's realities to advance the cause of poverty alleviation. We have set up a mechanism of targeted poverty alleviation, improved the mechanism of stationing officials in poor villages and reformed the management of poverty alleviation funding. We have also enhanced the financial support mechanism while upgrading the mechanism of inviting all social sectors' participation. In addition, we have improved the assessment mechanism for impoverished counties, established a supervision system, improved the methods used to delist poor households, villages and counties, and strengthened poverty reduction assessment and evaluation mechanisms. Also, we have found innovative measures to lift people out of poverty based on local realities. In places that are suitable for developing the photovoltaic industry, we have built village power stations to address the problem of power supply while helping local people increase their incomes through generating electricity. In places that are suitable for developing tourism, we have turned beautiful mountain and river scenery into tourist attractions to help local people become wealthy. In places with abundant labor resources, we have guided developed coastal provinces in the east to provide job opportunities so that poor people in less developed provinces in the west can gain employment in other provinces. In places that are sites of ecological protection, we have arranged for local impoverished people to work as rangers and, thereby, receive a stable income. A total of 280,000 rural residents have benefited from this program. Despite the achievements, China is still the largest developing nation, and it has a sizable poor population of 43.35 million. Poverty alleviation remains a daunting task. However, China is determined to ensure every person in the nation lives a comfortable life by 2020 and is confident of realizing this objective. The UN has adopted the 2030 Agenda for Sustainable Development, with eradicating poverty as one of its priorities. The fight against poverty has entered a new stage. President Xi has proposed that establishing a new international anti-poverty partnership with a win-win approach is the way to guarantee the success of poverty alleviation efforts. China will give full play to the roles of international platforms for poverty alleviation such as the International Poverty Reduction Center in China, which will put forward China's plans, contribute the nation's wisdom and facilitate the sharing of its experience in poverty reduction among developing nations.